A new highway promises to ease vehicle traffic between the cities of La Punta and Chorrillos, in the central region of Peru. Known as La Costa Verde Del Callao [The Green Coast of the Callao], the highway will be nearly 5 km long, with four viaducts and six lanes, three in each direction. 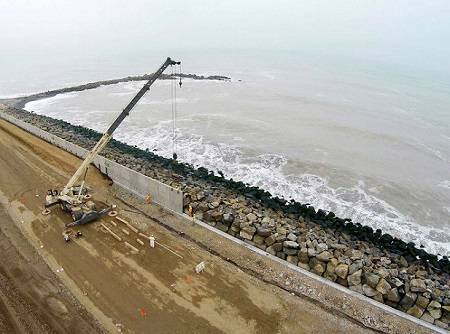 Built on land at the ocean’s edge, the work required Maccaferri solutions for containment of reinforced soil in order to guarantee stability of the new pavement. “Our solutions for retaining walls and structures in reinforced soil are ideal when built on soils that have a low bearing capacity. They enable better settling of columns when compared to other traditional solutions”, said Maccaferri’s marketing coordinator, Paulo Ferretti. He explained that the company has know-how in building “megastructure” landfills and reinforced soil structures, which can come to be over 30m tall. Maccaferri Perù is proud to have supplied MacForce for the realization of this project. With completion scheduled for December 2016, La Costa Verde Del Callao will feature 21 thousand square meters of bike lanes and sidewalks. The construction consortium, “Via Costa Verde Callao”, composed of Constructora Norberto, Odebrecht S.A., Sucursal Perú, Odebrecht Perú Ingeniería e Construcción S.A.C. There is also a commitment to building a leisure area with green zones infrastructure for sports and nautical activities. The construction of La Costa Verde Del Callao began in 2014, with a US$ 500 million investment. The new infrastructure, apart from reducing travel time between Chorrillos and La Punta, will boost trade and tourism in the region, in addition to expanding business opportunities and services. Given the importance of the project, this was also described by a major business magazine in Peru, Gestiòn, which devoted its economic section to the the sponsorship of the same. For more information, please contact our subsidiary.